James Newton Howard has hovered around the periphery of Hans Zimmer's Media Ventures studio for quite some time now. His name has appeared in the enigmatic "thanks" sections of CDs way back to The Rock, and Batman Begins saw a direct collaboration between Zimmer and Howard, the first collaboration between two truly A-list composers since 1956's The Egyptian (where Bernard Herrmann and Alfred Newman worked together). 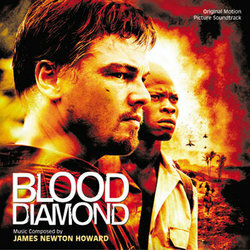 Still, it comes as a surprise just how much Blood Diamond sounds like an archetypal Hans Zimmer score. I'm not complaining - as followers of my reviews know, I am a huge admirer of Zimmer's - but it is still surprising, and perhaps a mite disappointing to the die-hard James Newton Howard fans who were upset by the sparse amount of Howard that appeared in Batman Begins and its sequel, The Dark Knight. Undoubtedly, though, this is a Howard score, even if the only track that lies firmly in his trademark, romantic region of tender, string-accompanied piano themes is the beautiful "Thought I'd Never Call? ", which is similar to the Howard sections of Batman Begins. Howard has ever been a master of diverse rhythms, as his excellent scores to the Disney animated flicks Dinosaur and Atlantis: The Lost Empire testify. The African beats used to a great extent here are authentic enough so they don't sound cheap or sampled, and are accompanied by a variety of ethnic instruments, from a Dinosaur-esque African choir and vocals ("Solomon Vandy", a highlight) to marimbas that stray towards Thomas Newman's trademark complex rhythms ("Archer Sells Diamond"). All of these remain in a comfortably Western harmony scope, in the same way that Hans Zimmer's music did for The Last Samurai. 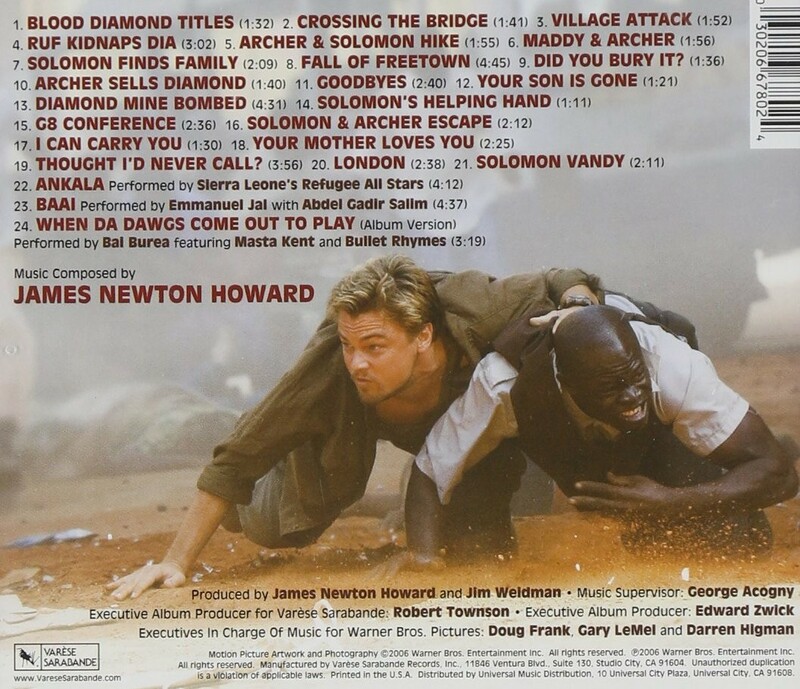 The action music in Blood Diamond is excellent, though rather dissonant and much more electronic than Howard's more traditional, Waterworld-inspired sensibilities employed in the Disney scores. The African rhythms remain, though they are considerably sped up in tempo and transferred to a far deeper percussion section that, again, draws its inspiration from Hans Zimmer (the drums nearly attain the massive depth of King Arthur in "Fall of Freetown"). Added to this are distortion guitars that are employed with far more taste than I have heard elsewhere in film music. It makes sense if this reminds of Black Hawk Down, but the music never approaches the wild chaos of that score, and is therefore a good sight more listenable. Blood Diamond's main theme is very much within the realms of Media Ventures, but the beauty of these themes is that they are accessibly simple, and beautiful enough never to tire. 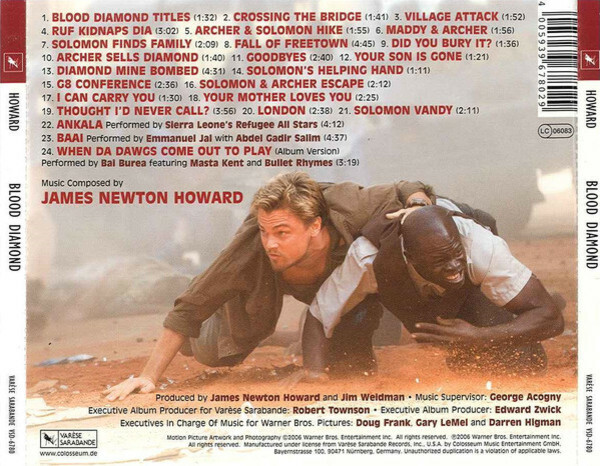 Such is the case of the main theme of Blood Diamond, which strays from guitars to choir to the aforementioned piano-strings combination. Its most robust statement is in the penultimate track, "London", unquestionably a highlight. 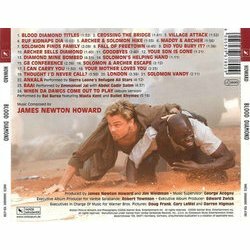 All in all, Hans Zimmer fans looking to broaden their scope - which is how I stumbled across this score - will find Blood Diamond an enormously useful and entertaining springboard from which to plunge into the deeper pool of James Newton Howard. Ironically, Blood Diamond - minus the African influences - sounds rather like what Batman Begins and The Dark Knight should have sounded like, had Zimmer and Howard managed to mingle their styles more effectively. Fans of both will find plenty of merit here, and it is certainly one of the best scores of 2006.